As Inauguration Day draws closer, Donald Trump’s transition continues to break with ethical standards that have had bipartisan approval for decades. Now his cabinet nominees are scheduled to have hearings in a slap-dash, marathon day of Senate gabfests. This is designed deliberately to make it impossible for senators and citizens to fully consider the nominees. Among the reviews still being conducted are FBI background checks, OGE investigations into conflicts of interest, and financial disclosures. And what makes this all the more interesting is that Senate Republican Leader Mitch McConnell had the very same concerns. Not now, but back in 2009 when it was Obama’s nominees being considered. McConnell wrote to then-Majority Leader Harry Reid to insist that all these reviews must be completed and returned in enough time to review prior to the hearings. Not surprisingly, Reince Priebus, Trump’s Chief of Staff, is comfortable with jettisoning ethics reviews. On Fox News Sunday he said that “there’s no reason … they have all the information that they need. It’s no different from any other new administration coming in.” However, McConnell’s letter proves that it’s entirely different. The standards that Republicans impose on Democrats is a much higher one than that to which they hold themselves. That’s why their nominees have been criticized for their blatant conflicts and unsavory behavior. And it’s why Republicans are so anxious to shove these cretins through the confirmation process before everyone finds out about them. This is no longer the country I grew up in. This makes the fascism of the 1950s a case of child’s play. I do not see a way for the country to overcome this. Mexico building a wall to keep Americans out may no longer be a joke line. 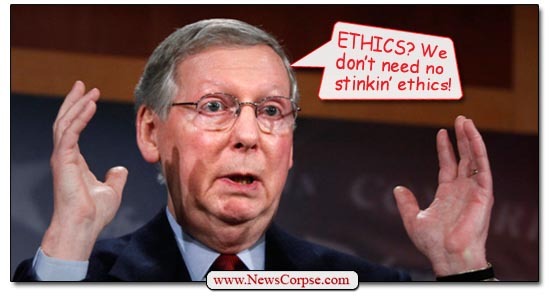 McConnell has no ethics, morals or values. His and his party are hypocrites and worshippers of the god greed by whom they all profit handsomely. When will the voters wake up and vote them into obscurity. Ever notice how McConnell gloats? He is the epitome of evil. I am surprised that anyone is surprised. The country elected a candidate who has spent his entire life dedicated to making himself look good no matter what. He is only comfortable around people who worship him and agree with everything he says. This includes accepting his idea that his appointees are the best. We will soon be led by a narcissistic fool and his sycophants. The only thing that could be worse is for Trump to leave office and we regress to a Pence led theocracy. The Democratic party had better quickly learn and find some good progressive candidates and fight for every political office. Otherwise, we will become a truly fascist nation. I am curious if the republicans realize Drumpf would be a disaster and are letting this unfold, leading to Constitutional violations, and subsequent impeachment. This would make Pence president and his agenda would be more palatable to them. Trump and his minions live in their own reality. They make it up as they go along. What happened before makes no difference and procedure is what they decide it to be. More proof that worthless sack of sh*t, tdump, and his cabinet full of sh*t, have NO business in the white house.